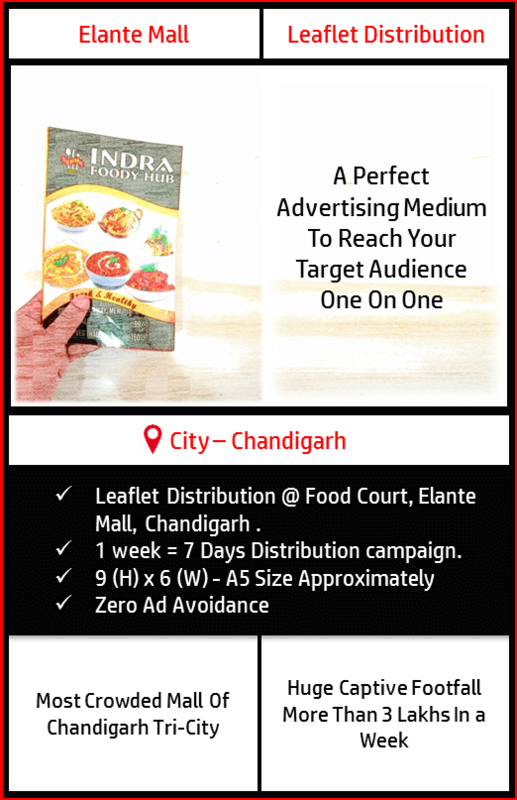 Advertising Medium- Leaflet Distribution@ Food Court, Elante Mall, Chandigarh. Massive Crowd Targeted: More Than 3 Lakhs Captive Audience in a Week. Hence, Massive Impact. Focused & One to One Mass Targeting. Top of the mind recall among-st the targeted audience. Highly Recommended for those seeking for a Cost Effective Advertising Medium Targeting A Massive Footfall. This package ensures a Huge Brand Recall & Great ROI by enhancing a wide reach to the target audience. Why Leaflet Distribution Ads in Food Court? Food Court, Elante Mall, Chandigarh is one among-st those unique advertising mediums which justifies your budget as well as strengthen your Brand Power. Total Crowd Targeted: More Than 3 Lakhs People in a Week. Every individual visiting food court have to visit cash counter. The representative of the brand will distribute Leaflets near the cash counter which comprehensively ensures that each and every person will be targeted. It ensures hitting the Bulls Eye i.e. Brand message can be conveyed and explained in detail to the targeted audience one on one. Top of the mind recall among-st your target audience which ensures maximum mileage for your Brand. Huge Brand Hammering & Great ROI. The availability of the media depends upon the time of booking. Creative to be provided by the client in CDR & JPEG format both in advance before getting printed so that the same gets approved by the Elante Mall authorities. Exact size of the leaflet would be shared with the client at the time of the booking of the campaign. Big Media Kart can get the Leaflets printed on client’s behalf. The Printing Cost will be extra and to be borne by the client itself. However, client can also provide its own printed leaflets to Big Media Kart. Big Media Kart strongly recommends that the client appoints the distributor itself. However, Big Media Kart can also appoint the distributor on client’s behalf with an extra costing which would be borne by the client itself. The size of Leaflet/Pamphlet should be approximate to the size mentioned above. Why Elante Mall Advertising in Chandigarh?